A family beach holiday in England in autumn? What were they thinking? That’s what we wondered when one of the Love Cottages team said they were off on a Devon cottage holiday in November with some friends and four kids under four. Well they went. It rained. It blew one hell of a gale. And they all came back in one piece, and in a rather relaxed state of mind too. How did they manage that?! They went to Salcombe. But is it that simple? Now, bearing in mind they’re based in Oxfordshire, that’s not exactly a short drive. And it’s rare that a journey of more than 1.5 hours with kids on board can be done in one stint unless you’re travelling through the night. On the way down, after some crazy antics from their satnav, they got as far as Exeter Services before needing to stop and refuel everyone. So after one stop and about 3.5 hours in the car, they were met with the seaside, plentiful beach options, some nice shops, some yummy local produce, family friendly pubs and restaurants, and comfy beds. Not forgetting one rather unforgiving weather front. What the heck though. They were prepared for every eventuality and still had space in the car for the kids. Rugged up in Spotty Otter waterproofs, umbrellas abandoned, raincovers on buggies, it was time to hit town. The beauty of Salcombe at this time of year is just how quiet it is. 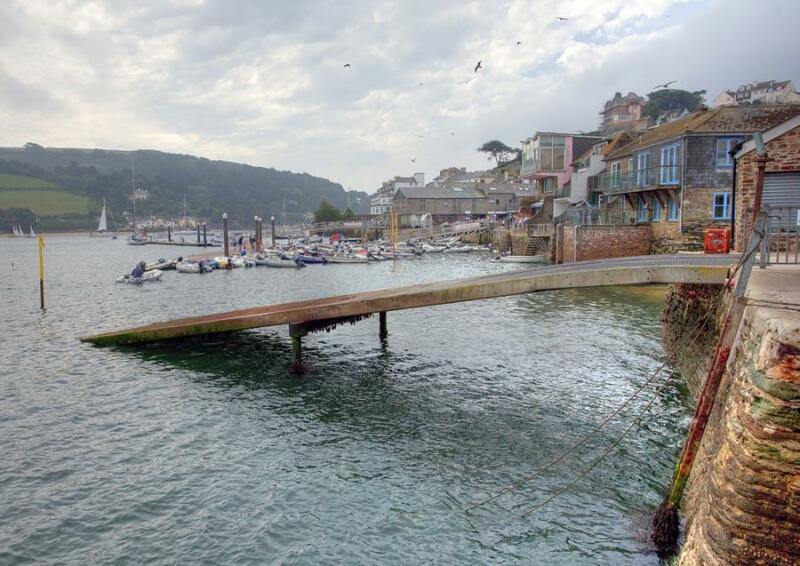 Devon is the UK’s second most popular holiday county after Cornwall and villages such as Salcombe, on Devon’s south coast, draw crowds that its narrow, winding, hilly roads were not designed for. It’s amazing really, that Fore Street is not pedestrianized; it’s so narrow that some of today’s widest family vehicles have to navigate it very carefully. After a mooch around the shops (not all are open on Friday afternoons in the off season, though they do open on Sundays) it was time to warm up by the fire in the Kings Arms. This is one of two pubs half way up Fore Street. More on the other later, but both could be rewarded with a position at the top of any family friendly pub – they couldn’t have been more welcoming. Despite the weather forecast, Saturday turned out quite fine and it was a day filled with foodie delights. After good coffee and amazing scrambled eggs at Sailor V, it was a short, undulating drive to North Sands and The Winking Prawn for a crèche-like lunch. Everyone was in there with kids and sometimes that brings an unusual calm to a place. Although the children’s’ menu is limited to sandwiches, that’s more than made up for by the treasure chest of dressing up clothes to keep them occupied while you nibble and quaff your way through the menu. Foodie Saturday was rounded off at the Old Inn in Marlborough, about 3 miles north of Salcombe. Unassuming village pub on the outside, unbelievably kid and parent friendly on the inside. Think jigsaws and endless colouring books with better-than-good pub food on the menu. In between the day’s food stops, the sun popped out to say hello for an afternoon of blue skies making for a muggy autumn afternoon. Aside from a slight mishap with a wave wiping out one of the kids rather unexpectedly, a couple of hours on North Sands beach was ample entertainment for all: rocks to climb, pools to explore, seaweed to fascinate the smallest of hands and soggy dogs to excite them, and some brave surfers that the adults watched with mix of admiration and bemusement. A blustery Sunday was gratefully dry for Salcombe’s Remembrance Day service outside the Salcombe Yacht Club where the war memorial stands proudly overlooking the estuary. For a small village, there were innumerable wreaths laid in memory of lives so selflessly lost. A seaside Sunday lunch was sought at the Victoria Inn – the other Fore Street pub we mentioned (there are more, but we’ll have to return to review those!). With a look of recent refurbishment, there were highchairs a plenty, boxes of toys and books, and a healthy children’s menu too. Champagne by the glass and a towering open sandwich of locally caught white crab meat left just enough room for some honeycomb ice cream from Salcombe Dairy. And in preparation for the journey home, a pick and mix treat from Cranch’s – that’s the very pink shop frontage selling the most amazing range of sweets, rock and fudge! At this time of year there is plenty of parking, but if you’re visiting any time between Easter and October half term it’s much trickier to find a space. So it’s worth checking out the parking options before you arrive. If you’re staying in South Sands, the tractor ferry runs across to Salcombe between Easter and the end of October every half hour. It occasionally runs trips to Kingsbridge and South Pool in the evenings too. There’s also a Kingsbridge-Salcombe ferry too. So that’s how they did it. Some lazy mornings at the cottage, plenty of child friendly eateries, a spot of shopping and a lucky afternoon on the beach. And so was filled a weekend that entertained, fed and watered everyone from 10 months to 40-something while savouring and supporting all that the local economy had to offer. That’s why we love cottage holidays.